Every 3 months I would sail our 20 metre, gaff rigged, timber ketch from our island home (Middle Percy Island) to Mackay on the central Queensland coast; a distance of 70 nautical miles. The journey usually took between 10 to 12 hours one way. Once there, I would pick up 12 weeks’ worth of mail and shop for supplies; the things we couldn’t grow, make or produce for ourselves on the island. The return trip to Middle Percy was nearly always against the prevalent south east Trade Winds and could take up to 18 hours or more, sometimes even a few days if the weather was foul and forced us to take shelter behind another island. Our boat, the Ruby Charlotte, is an old Torres Strait Island pearling lugger. Built as an Island work boat and once used for harvesting pearl shell. During our time on the island these three monthly trips to mainland Australia, the boat was laden with a very different cargo. We carried milking goats, ducks, drums of fuel, tons of wheat, rice, quad bikes and a mini tractor. We even carried a long wheel base Land Rover strapped to the back deck. We made enough money to buy our supplies by maintaining a cottage industry, making and selling handicrafts and garden produce to the many passing yachtsmen and women, who were sailing along Australia’s east coast. In later years we added to our meagre income by becoming observers for the Queensland Bureau of Meteorology who paid us to report local weather conditions 5 times a day. 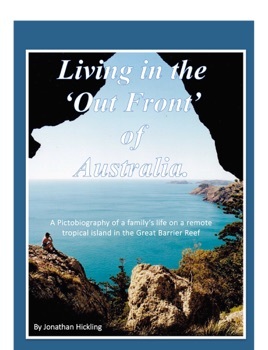 We also compiled a history book documenting the island’s incredible story. The book called ‘History of the Percy Isles’ was self-published and sold exclusively from the island. It is now available as an E-book available from the Apple App Store or as a printed copy from rubycharlotte@hotmail.com. My wife (Liz) and I and young son Jacob arrived at Middle Percy in 1989, our second son Justin was born in March 1991. For the first seven years we served an ‘apprenticeship’ with the island’s lease holder whom some people called the ‘old hermit’. Andrew Martin was a larger than life character who’d lived on the island, mainly by himself, for 25 years. Andy taught Liz and I the skills necessary to live and subsist off this remote 'desert island'. By 1996 an ageing Andy felt the need to return to his birth place, England. He left us in charge of the 5000 acre island, promising to add our names to the lease as a good will gesture. He said that we, above anyone else, had more than proved ourselves by investing our time, effort and money and because we tolerated him for 7 years.